I had a very odd experience today. I was on the way to yoga this afternoon, flicked on the radio to a show playing down the top twenty from this time in 1978 and this song came on. Within seconds I was in tears. Please ignore Noel Edmonds and his apalling joke at the beginning! Now I often do get an emotional response IN yoga classes. But not driving to them! Some may say it is a natural reaction to the dreadfulness of the music. But it was not that. I am well known for not having highbrow musical taste and am well inured to such criticisms. Later, hanging in Down Dog I decided it was one of two things. Or both maybe. I have been spending time with someone close to me who is very excited about impending parenthood. This has got us talking about our childhood memories. 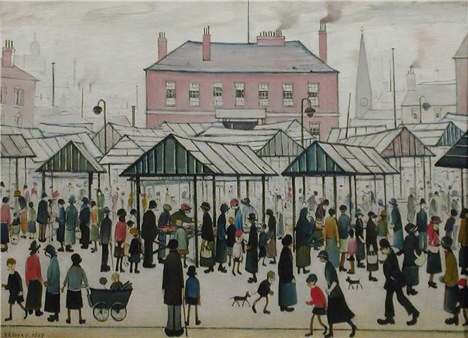 Whilst we never discussed the paintings of LS Lowry I certainly remember the song and being shown some of the paintings. In hindsight that was probably because of this song which was number one when I was eight. It is possible this was the way I first learned about art. They originate from not far from where we live - Salford and Ancotes - are inner city areas of Manchester and places I have driven through to get to and from work on many occasions. So maybe it was a sort of flashback thing. Two weeks ago I began to work in my home town again after years of working anywhere but. I have been feeling a strong sense of localism so, although Salford is maybe half and hour away maybe it was still close enough to touch a sense of belonging/memory that has been simmering underneath my consciousness? But more, I think it was a sudden clarity about what can be the sheer simplicty of making art if we choose noto to complicate it. "He took his brush and he waits, outside them factory gates and he waits to paint them matchstalk men and matchstalk cats and dogs." As the song tells, he was not exactly well received at the time but now there is a rather spectacular theatre complex and art gallery named after him and showing his work in Salford. 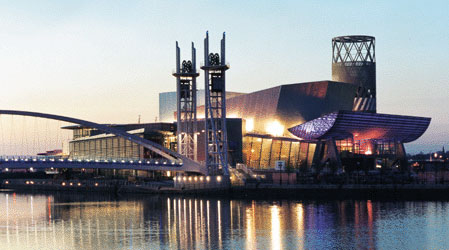 And a five star hotel down the road also called The Lowry. And all because he perservered painting his matchstalk cats and dogs because he liked them. I am curious... Did this song make it to the USA? If so, did it lead to the belief that we all wear cloth caps? And, Working Mum if you are reading... 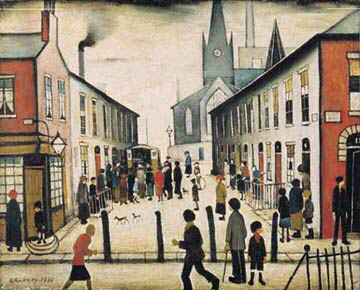 I have vague recollections that our school might have done something relating to Lowry about this time. Do you recall? Two Irish ( I'm not stereotyping, they really were) Ladies looking at the large ( just over a metre by a metre and half) printouts of the ipad paintings he did. Lady One: So what's special about these ones? Lady Two: He did them on a really, really big Ipad. There was an installation which consisted of a dark room full of furniture. Over the chairs, tables, TVs etc and over all the walls she had placed round flourescent stickers of various colours. A little girl was told by her Dad not to pick the stickers off. She looked up with a mixture of confusion and outrage and said, "At home, this would be naughty." 1. We went to Lime Lounge in Bath, usually a favourtite of ours. it opens at nine for breakfast. At nine forty we arrive. The staff greet us at the door, let us sit down, let us examine the menu then come over.
" I'm sorry. The kitchen is nowhere near ready to serve breafasts yet." Sigh. So why is the door open to customers then? We leave. 2. A couple of streets away the door to Cafe Lucca is open. Snother usual favourite. We walk in. Through the open door. "Sorry. We are closed," the waitress says. So why is the door open to cust.... Oh never mind. 3. We go to Same Same But Different. the door is open and so is the kitchen. but the teapot arrives with a chipped spout. i say, very nicely, in a very pleasant way, " Did you know the spout was chipped?" " Oh," says the waitress," Sorry about that." and walzes off leaving me with a chipped spout. i rather meant her to change the pot. 4. Now in London and pre the Hockney exhibition I agreed to meet Dennis at Pontis. It is not there. There is a building site but thanks to mobile phones we find each other and go to Ristorante Biaggio which has an upstairs and a downstairs. Ŵe are seated downstairs and I see that, unlike all the other food I see coming from the back of the ground floor, our dishes are carried down from upstairs into the lobby which is open to the street and thus the rainy air and back inside to our table. My pasta is cold. So is D's pizza. We ask the waiter to reheat it. No he says. It is not cold, the plate is cold but the food is hot. No. It. Is. Not. Quite possibly because you put it on cold plates. He is persuaded to take it away and comes back suspiciously quickly with very hot plates. And barely luke warm pasta. I call him back. I tell him is is still luke warm. He tells me it is not. I tell him it is and I am happy if he just puts it in the microwave. He tells me it is not cold. I tell him he will give people food poisoning and I am not arguing with him, he should just microwave it. He says it is not cold. We leave ( without paying for cold food or the drinks) and in the twenty minutes now available to us cross the road to Pret A Manger who CAN do a hot sandwich.